The U.S. military uses social media to target ISIS: Stop reminding the jihadis. It should stop telling us that. Right now. 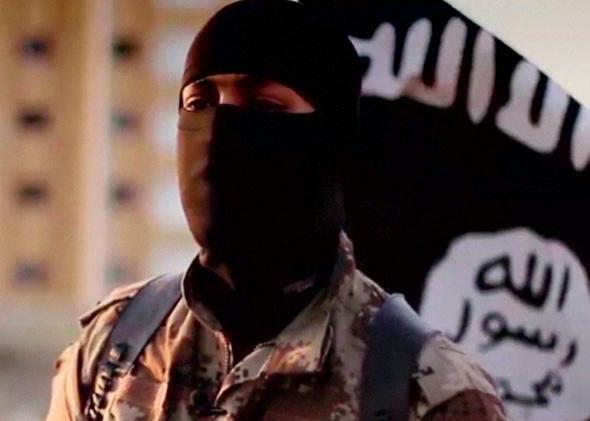 A boast, and a clue: A masked man speaks in a video that Islamic State militants released in September 2014, pictured in this still frame obtained by Reuters on Oct. 7, 2014. … and they see some moron standing at this command. And in some social media, open forum, bragging about the command and control capabilities for Daesh, ISIL. And these guys go: ‘We got an in.’ So they do some work, long story short, about 22 hours later through that very building, three [Joint Direct Attack Munitions] take that entire building out. Good work, Air Force. Well-done. Now please shut up. Why? Well, for the same reason why it’s best not to remind robbers about silent bank alarms, tell mobsters about FBI phone taps, or highlight for FIFA officials which countries lack extradition treaties with the United States; you want the bad guys to trip up. Sure, they should know better, but just like any one of us who know we should have different passwords for email and bank accounts, people are lazy and make mistakes. We live in an interconnected world where just about everyone has a smartphone with a camera, even jihadis in Syria and Iraq. As twentysomethings, these foot soldiers are eager to post their tough-guy exploits on social media. American targeters can exploit this intelligence, but only if the adversaries actually go out of their way to create it. But every time some high-ranking official blabs about what sort of tactics, techniques, and procedures the United States uses to target terrorists, it firmly underscores to terrorist organizations that they should practice better operational security in the future. The top leaders in terrorist groups already know this—that’s why it’s been so devilishly difficult to strike them, since they often have few electronic signatures the U.S. can use to locate their whereabouts. Osama Bin Laden reportedly hadn’t talked on a telephone since 1998—after we tried to kill him. Mullah Omar has disappeared. ISIS chief Abu Bakr al-Baghdadi surely doesn’t gab on the phone, either. The guys who have survived more than a decade of brutal sectarian conflict are probably pretty smart fellows who abhor technology. The savvy ones don’t text or send their own email messages. They aren’t on Facebook or Twitter, and they certainly don’t hang out all day in jihadi Internet forums. But there are so many others—younger killers, wives, girlfriends, local jihadi wannabes—that are spewing out data, meta- or otherwise, every day. It’s hard to run a 21st-century caliphate on World War I-style motorcycle messengers and handwritten notes. But the digital spigot will be turned down if our military and civilian commanders keep reminding ISIS of their digital vulnerabilities. America’s struggle against ISIS isn’t going well. The Iraqi army is a wreck; Iran and its proxies run much of the show now. Syria is a Hobbesian nightmare of all-against-all. The United States has limited means to affect the outcome, but our ability to hit targets with precision and lethal force from the air is our big advantage. But to do so requires intelligence. Social media provides a lot of that intelligence. Reminding our foes that their battlefield-happy snaps are being turned against them is the equivalent of friending them.